How to play a dart game of Cricket. So you want to learn how to play the dart game called cricket. All of those numbers and different colored areas of the dart board might seem a bit confusing, but this photo gallery makes it easy to understand. Just follow the photos and you’ll be throwing like an champion in no time. Step 1 : The numbers to target. Before you can step up to the line and throw like a pro you need to know where to throw your darts. 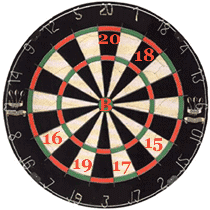 When it comes to the dart game of Cricket, all you need to remember are the numbers 20 through 15 and the bulls-eye. You will need to hit three marks for each number to win. Step 2 : The dart board. There are three main areas on the board – the single, the double and the triple. Throw a dart in the area labelled single and you get one mark. Throw a double and you have earned two marks. Hit the triple ring and you have scored all three marks with one dart - great shot! Step 3 : Who shoots first? In order to start a game of Cricket you need to know who throws first. Flip a coin and the winner gets to choose who throws first at the bulls-eye. Whoever is closest to the bulls-eye goes first in the game. If you both throw the same distance to the bulls-eye you have to throw again, however the last person to throw at the bulls-eye goes first. 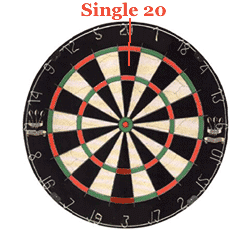 It’s also considered a tie if you both throw into the single area of the bulls-eye, even if one dart is closer to the double bull area. Keep throwing until one dart is the clear winner. Step 4 : Points. If you have hit all three marks for one number and your opponent still has that number open you can hit that number again and you’ll receive that number points in a running total. For example, if you have your twenties closed (all three marks) and hit a single twenty; you write the number 20 next to your name. Now your opponent has to close another number to start getting points on you. The winner of the game will have all numbers closed and the most points.